Yes, the same photo appears on pages 76-77 of the book Trackside Along the New Haven 1950-1956 by Arthur E. Mitchell, where it is identified as showing the Farmington River bridge on the New Hartford branch. The book also includes seven other shots of that train at other locations on the branch as Mr. Mitchell chased it south. There is a reminant of this bridge. The stone abutment on the south side of route 44 still exists. The abutment you are showing is the CNE. They had a bridge across the hollow, which New Hartford center sits in. The Canal and CNE (Connecticut Western) both tan through the gorge at Satan’s Kingdom. CW/CNE was on the north shore of the Farmington River, but crossed to the south, and next to the Canal. The Canal line and CNE ran parallel through Pine Meadow, with the Canal on the east side of the ROW. Since the Canal bridge across Route 44, and the river is east of the location of the photo, the canal crossed the CNE, but it was through a crossover, not a diamond, which was by Pine Meadow Station. After New Haven took over CNE, and CNE traffic started to diminish, Hartford bound CNE trains were rerouted to the Canal, via Plainville. After this point, a little CNE was used in Simsbury, which served a customer. The other remainder was the line between Hartford and Griffins. There was a 3 volume set of CNE books, and they came out in the 1990s, by Robert Nikki. If you find a set, it is useful because many track diagrams are included. Being from Plainville, my family used to drive through here frequently. I also traced out the CNE one summer with my uncle. No, I believe that is the New Hartford Branch bridge. The CNE was on the south/west side of the river through New Hartford. What did the Canal Branch to New Hartford serve? What did the CNE service? When was the line abandoned? I’m sure that the abutment shown is CNE. The Canal one was about where the car in front of the Google car is. Over one summer I did a thorough CNE exploration with my uncle who was a former New Haven employee, and railroad historian. He was around when CNE was still running, and his information was highly accurate. This friend and Noel used to take many rail fanning trips together, and I’m sure that Noel could vouch for the accuracy. The books that I referenced had many track maps in them. My spellcheck butchered the author’s name, which is Nimke. Only one line - the New Hartford Branch - crossed the river at New Hartford. See this 1925 topo and 1934 aerial. The photo in the original post is the Canal Line bridge, here is the streetview of the remaining south abutment. The other abutment being discussed is for the bridge pictured here (looking north, with Main St/US44 at right), which was on the CNE and spanned a brook and several streets. The Canal was supposed to have been extended northwest into Massachusetts. True. CT state railmaps from the late 1800's show a proposed line from New Hartford northwest toward Lee MA. 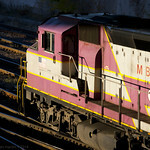 FLRailFan1 wrote: What did the Canal Branch to New Hartford serve? What did the CNE service? When was the line abandoned? I believe the big customer in later years was Collins Axe in Collinsville, 6 miles down the road. They manufactured axes, sledgehammers and such. 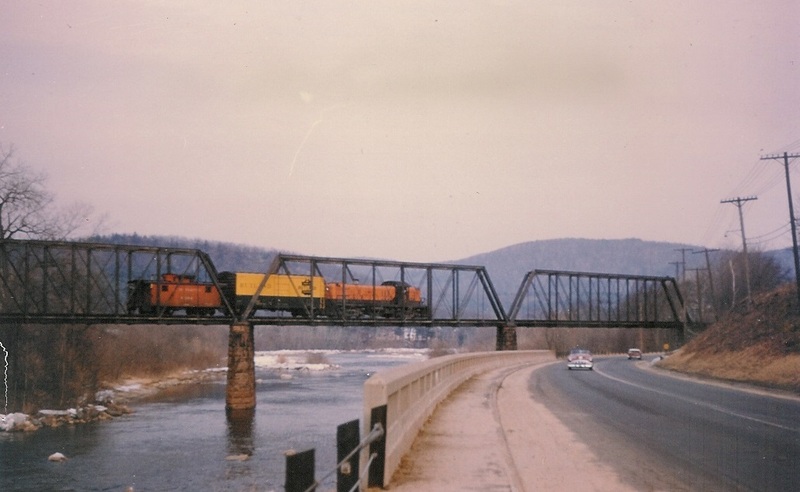 The New Hartford branch lasted into Penn Central days. The CNE was abandoned in the 1930's.